If you’re a novice, you may find some sports betting terminology amusing such as a “beard” or laying a “dime”. Every industry in the world has its own special terms to explain how they do business and sports betting is no different. Here's some betting terminology for people learning how to gamble on sports that should make you look less of novice when you're talking about sports betting in general. The next time someone tells you that the chalk is too expensive so they’re fading the Yankees with a nickel, you’ll know what the heck he’s talking about. We recommend you read the following betting terminology often! Betting Angles: Trends/systems regarding teams and how often they cover the point spread in particular situations. Typically, trends refer to a particular team while systems refer to the league as a whole. Against the Spread (ATS): Refers to a team’s record factoring in the point spread. Back Door: A “cover” that occurs in the waning moments of a game. Bad Beat: A tough betting loss that usually occurs late in the game often by an irregular play or officiating decision. Beard: A strange betting terminology to explain a runner; someone who places a bet for a big player. Beef: A dispute over the outcome of a bet. Book or Bookmaker: A person or off-shore website that accepts wagers. Chalk: Betting terminology for a team that is a favored, or "laying points" in a game. Circled Game: A contest on which betting limits are reduced, most likely due to a possible injury or weather. Cover: When a team wins against the point spread. Dime: $1,000 bet. You will often hear bettors refer to themselves as "Dime Players." Dime Line: 10 cent money line. It is the difference between the odds for the favorite and the underdog. Gamblers most commonly use this betting terminology in baseball. Dog: The underdog or team getting points. Early Money: Bets placed as soon as the sportsbook releases a line. Even Money: A bet where you win as much as you risk. The line would look like +100. Exotic: Any wager other than a straight bet or parlay (also referred to as a proposition or prop). Fade: Wagering AGAINST a particular team or situation. First Half Bet: Bets decided by the halftime score. Favorite: A betting terminology that indicates a team that is expected to win a particular contest. Handicap: Analyzing a game or event for gambling purposes. Handicapper: A person who studies factors such as statistics, injuries, weather and news to predict the outcome of games. Handle: The amount of money received by a book on a particular event. Hedge: To reduce amount of action by wagering on the opposite side of a previous bet. Juice: The commission paid to bookmakers. Also called the “vig” or “vigorish.” On a $110 bet, the winning bettors collect only $100. The extra $10 is the juice. Laying Points: Betting on a favourite. Letdown: When a team comes off a surprising or important victory, it is prone to a poorer performance in its next game. Limit: Maximum amount of money accepted for one wager. Linesmaker or Oddsmaker: The person who sets the wagering lines for a particular sporting event. Lock: A sure fire winner (there really is no such proposition). If anyone tells you that they have a “lock” to sell you, run away as fast as you possibly can. Longshot: An unlikely betting outcome. Look Ahead: A betting terminology to explain when a favourite is playing an underdog prior to an important game. The favourite may take the underdog too lightly. Middle: Betting both sides of a game at different prices with the hope of winning both wagers in sports that offer point spreads. For example, if a bettor played Dallas (minus 5) and Boston (plus 7), and Dallas won 100-94, he would win both bets -- or "catch a middle"). Money Line: A bet where you are only predicting the straight up winner. Money line wagers are also the norm in MLB baseball betting and NHL Hockey betting where there is no point spread. Odds (lines): The point spread or money line on any given game. Off The Board: A betting terminology to explain a game where no action is being taken. This is a temporary condition, usually due to injuries, suspensions or weather. Opening Line: The initial odds being offered. 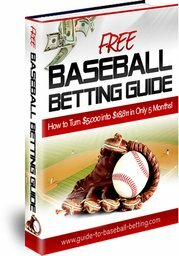 Online Sportsbook: Guide to Betting Baseball currently recommends Pinnacle Sports, 5Dimes, and Diamond Sportsbook. Over: When the score for two teams combined is greater than the total set by the oddsmakers. Over/Under: Also called the total. For almost every game you can wager on whether the final score will go “Over” or “Under” a set number. It does not matter which team wins or covers. Parlay: One bet ticket written with at least two wagers (all must win for the ticket to cash). Pick’em : A game with no favourite (the straight-up winner also would win bets). Point Spread: The line used for gambling purposes. The team perceived to be superior will be favoured while the team perceived to be inferior will be the underdog. A point spread is set at a given number to draw even money on both sides of the wager. Puck Line: A hockey-only bet in which the bettor can either take the favourite -1.5 goals or take the underdog +1.5 goals. Pup or Puppy: Another way of saying this betting terminology is Underdog. Runline: A baseball-only bet in which the bettor can either take the favourite -1.5 runs or take the underdog +1.5 runs. Rundown: A list of odds on a particular day's games. Runner: One who places bets for another. Sharp: A sophisticated or professional sports bettor. Smart Money: The money wagered by those perceived to be sharp or expert bettors. Sportsbook: A place that takes bets on sporting events. Square: A novice sports bettor. Steam: Heavy action on one side of a game. Straight Up: The actual outcome of the game, without the point spread. Straight Bet: One wager (as opposed to a parlay). Sucker Bet: Parlays, teasers or exotics (anything bookmakers use to entice squares to bet more). Taking a price: Betting an underdog. Tapped out: Broke from gambling. Tout service: A company that sells selections on games (many are dishonest). Teaser: A bet that consists of two or more teams and all of the teams have to cover the point spread for the bettor to win. Unlike a parlay, a bettor can use an alternate pointspread either adding or subtracting points from the actual line. Trends: How teams perform in specific betting situations. For example, the New York Yankees are 10-0 when leading after 8 innings. Under: Opposite of “Over.” Term used when a game’s final score falls below the expected total. Underdog: The team expected to lose a particular sporting event. Upset: When the underdog beats the favorite straight up. Wise guy: A professional sports bettor. Vigorish or the vig: See "juice". I hope you found the sports betting terminology helpful. Good luck in your baseball betting.